A poem caught while spending time with my community of practice last night. *A poem caught with my fellow Integral City travellers, Marilyn Hamilton, Cherie Beck, Alia Aurami and Ellen van Dongen. Organizing for emergence means actively engaging in our individual and collective learning journeys, stopping to notice where we wish to go, and trusting that thresholds we face (and cross) along the way allow us to emerge in that direction. We reach not quite the destination in mind, but something that still suits us, something that somehow makes more sense. I am concluding Part Two and moving on to Part Three at just the right time. Today is the Spring Equinox: the light of day is waxing and I am leaving behind the darkness I felt, and struggled with, three months ago. Yet that darkness was productive, for I explored the essence of Chapters 4-6, each with a focus on a facet of how we organize for emergence (journey, destination and emergence) and Chapter 7, their relationship with the city’s habitats – our nest. If we welcome and seek deeper knowing, we invite uneasiness. As we work to organize ourselves, in cities or at any scale, we must develop practices to explore uneasiness. Our social habitat is key to the journey we face in cities, for it is where we see, acknowledge and respond to the our habitat: the development of cities – new work – is a survival skill. Explicitly acknowledging our learning journeys, as individuals and as cities, is a survival skill that allows us and our city habitats to evolve. I conclude Chapter 4 with 10 practices for the uneasy city journey and the notion that cities are a platform for our never-ending learning journey. In Chapter 5 – Destination Alive or Adrift, I discerned destination as some kind of improvement. At every turn, that is our work in cities, to improve something. And what we choose to improve always changes, so the very purpose of evolution is evolving. For cities particularly, this means that their purpose is both for our survival and improvement. Our work moves us in a direction, even if we can’t quite see it in the moment. As I explored nested, or scaled purposes, I found that the more immediate the purpose, the more specific the destination. The more ‘expansive’ the purpose, the destination becomes a direction: improvement. A city’s destination is our evolving purposes, where each citizen is a building block for the larger, whole, city. As we pursue our improvements and purposes – our passions – our city enables us to do so. It does, however, require us each to ask: what is my intrinsic purpose, and how is that instrumental to the intrinsic value of the city? In other words – if we are the building blocks for our city, what sort of building blocks do we choose to be? What are we choosing to build together? What is our destination? Destination is simultaneously alive and adrift. It is most alive when we work from our passion, our inner drive to improve. When we catch glimpses of bigger destinations,for both self and the city, our direction, through short-term destinations, is discerned for fleeting moments. Between these fleeting moments, we fell adrift, which is to feel alive. We learn consciously and unconsciously, spurred on by persistent practical problems. We chaotically reorganize ourselves by exploring our in-tuition. We take a step back from the edge, as needed, in order to choose the right leap for the context. We are learning how to let a scary idea warm us up first, then explore the inner struggle, recognizing that each struggle is powering us up for something bigger and more challenging. The more we consciously explore the thresholds before us, and their nature within us, we will make wiser choices, to either go forward or turn away, as appropriate. It is in each of us to reach the places we wish to go. Our exploration of thresholds allows us to emerge to new destinations, to see and reach new possibilities. Chapter 7 – (Un)known Possibility wraps up Part Two, noticing that we shape our physical habitat (neighbourhoods are up to us) and our social habitat (neighbourhood soccer fields), both of which, with practice, allow us to serve possibility in our lives. We look at our cities from a different perspective (stand on the city’s river). We follow what we are courageously smitten with step into the unknown. We grow antennae to look for and explore thresholds. We actively seek ways to find possibilities unknown to us. We chaotically reorganize to reach toward what we long for. As I head into the Part Three, I realize that I don’t know what will be written. The writing to be done is murky and unclear, but with focus, searching for ways to learn and exploration of emerging thresholds, it will come. A Nest City of (un)known possibility. I continue to focus, learn and emerge. My work continues to focus, learn and emerge. In my last post, I declared a goal: to have a supportive relationship with 40,000 people about cities and our relationship with them. I have crossed a threshold to think this goal, let alone say it out loud and communicate it to the many of you who are reading my blog, following me on twitter, LinkedIn and facebook. This goal makes me feel distinctly uncomfortable, so I recognize it as my own version of a threshold of a new age. This goal requires me to reach out very far, much farther than my internal filters say is appropriate. I am a ‘good Canadian’, who doesn’t toot her own horn. Yet the opportunity before me, using social media, is profound. It is a new age, where I can connect with people across the planet. The people who see cities as I do are not concentrated in one spot – we are all over, and there is so much to learn from each other’s experiences. Because of this new age, I can find my tribe across the planet, build relationships with them and seek out ways to support each other in our work. This, I actively wish to pursue: making connections and see what comes. Each level on the Spiral is a new order of complexity (complexity is increasing with movement upwards). As Holman puts it: “Emergent order arises when a novel, more complex system forms (p. 18).” There is a transition from one order to the next, and in this transition there is a threshold. The passage to a shoreline of a new world, from the sea, can be rough or calm. Whether a straightforward or dramatic manoeuvre, it is a transition from what we know into a world we do not know. It is daunting and thrilling at the same time to make the voyage through thresholds into the unknown and the uncertain. As cities and citizens we come upon thresholds. What is their role in our own emergence? This post forms part of Chapter 6 – Emerging Thresholds, of Nest City: The Human Drive to Thrive in Cities. Click here for an overview of Chapters 4-7 (Part 2 – Organizing for Emergence). Click here for an overview of the three parts of Nest City. As I make the transition from destination to emergence, from writing pieces of Chapter 5 to Chapter 6, I’ll take a moment to lay out the threshold at which I stand. I have been exploring how destination, journey and emergence are critical elements to how we organize ourselves at any scale, from self to city to species. These three elements are forever in relationship with each other, within a nest of possibility that we both can and can not imagine. A series of posts on journey culminate with the notion that cities are a platform for a never-ending journey and 10 practices that support the journey. As part of our evolutionary journey, cities are meant to feel uneasy. A subsequent series of posts on destination conclude on this note: destination is both alive and adrift. Our purposes are both planned and unplanned. Today I am at the threshold of exploring emergence and its role in how we organize our lives in cities. This is hinted at in both journey and destination; it is time to be explicit. We have to cross to come alive once more. Over the course of the last nine months, I have been sharing bits of the book I am working on – Nest City: The Human Drive the Thrive in Cities. I made a decision to share the book on my blog while I was working on it. Five chapters and 126 posts later, the decision to share this work before it is officially in book form is one I revisit over and over in my mind. I learn in bite-size pieces. I get to dive into small passages and sort and sift around in my being to seek out what I am learning. I write in bite-size pieces. These are small pieces that serve to help me wrap myself around a thought. Blogging helps me discern the pieces I have to work with, that will later shape up into book form. This is essential time to practice the craft of writing. We find each other. By sharing the pieces of my exploration, fellow explorers and I are able to find each other. As I share, I reveal myself to my audience, and my audience reveals itself to me. We build supportive relationships. I am receiving feedback from readers: the odd comment here on my blog, an email, a ‘like’ or comment in facebook or Linked In, or new followers on Twitter. I am hearing about how my writing supports others and the work they do. In return, readers are supporting me too by using my blog posts on their webs sites, as they teach, and simply by giving me feedback on what resonates for them. We grow our understanding – of selves and cities. The more we explore individually and collectively, the more we learn and improve. We are expanding our consciousness. I don’t know – yet – what my writing will add up to. I do know that my writing, when published as a book, will not read as it does here. While I have a destination in mind – a published book that we can lay our hands on physically and digitally – I do not know exactly what it will say and how it will say it. I have a frame that I am using here, with chapters and the like, but I an open to that changing if and when that makes sense. With each post, my sense of direction gets more clear. Even what the book will say gets more clear. But the real book to come is in the process of emerging. The very process by which we create our cities, through the interplay of destination (chapter 4), a learning journey (chapter 5) and emergence (chapter 6), is in play for me as I craft the book. I have a destination/direction; I am on a learning journey; I am about to explore the thresholds that each of us, and our cities come across as we emerge. The next series of posts will explore the role of emerging thresholds as we organize ourselves and our cities for continuous improvement. The purpose of the city is survival and improvement: survival of the human species and the improvement of the quality of our life conditions. The first-order and second-order purposes described in city purpose – survival and improvement, are essentially this: the drive of all living things to survive and reproduce, and, in humans, a self-reflective capacity. Humans possess free will, and for Steve McIntosh, author of Evolution’s Purpose, this means that we have the ability to perceive and pursue higher values. …it is this emergent capacity to discern and make moral distinctions that gives us the ability to evolve our culture. Because of our sense of higher purpose – because we can feel the ever-widening potential of a better way – humans are continuously driven and drawn toward more complex forms of social organization (p. 146). Our drive for improvement, the “ever-widening potential of a better way” pulls us in our own development of how we organize ourselves. The top 100 trends in urban thinking reveal the nature of this pull in the year 2012: cities are idea makers, density catalyzes human progress, the reason for the existence of cities is the well-being of inhabitants, and collaboration as part of the human experience. Our ways of organizing ourselves are continually emerging into higher levels of complexity. 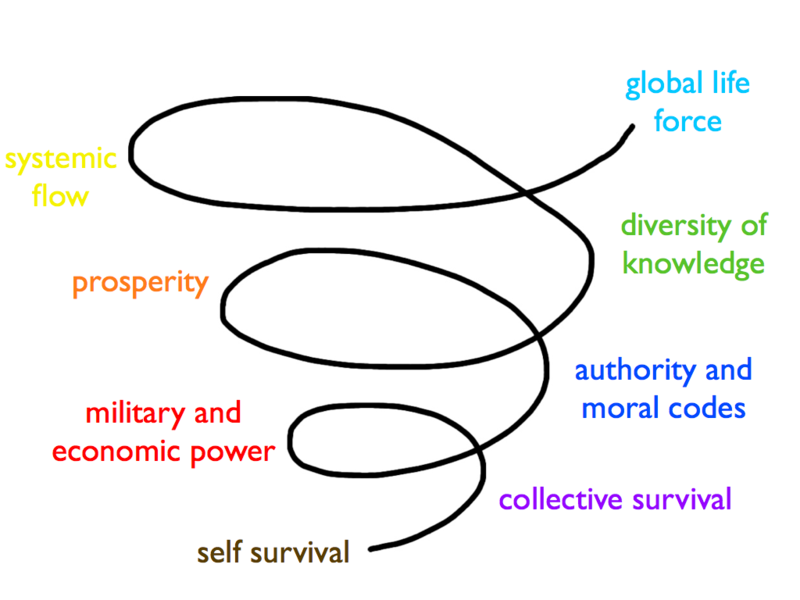 One way to look at these increasingly complex forms of social organization is through Spiral Dynamics, where our development, in response to our life conditions, oscillates back and forth between me/myself/I (warm coloured text on left) and we/us/our (cool coloured text on right). As we develop, we value new things and the very purpose of our cities evolves along with us. We have within us an impulse to thrive in cities. While we work continuously to organize ourselves to change and improve our life conditions, we are moving in a direction that is expansive and emergent. We are growing. While the specific destination is unknown, the general destination is known: survive and improve. As we work at our short-term destinations day-to-day, we can trust that an overall destination is emerging. There is direction in destination. What is the nature of your city’s emerging destination? 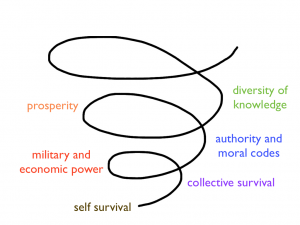 For more on Spiral Dynamics: a primer on the emerging spiral, 7 principles that frame the emerging spiral, and conditions for evolutionary expansion. For more on city purpose: Is the unplanned city unplanned? Part 1, Part 2, Part 3, Part 4. This post forms part of Chapter 5 – Destination Alive or Adrift, of Nest City: The Human Drive to Thrive in Cities. Click here for an overview of Chapters 4-7 (Part 2 – Organizing for Emergence). Click here for an overview of the three parts of Nest City. We limit ourselves greatly when we focus on what we have to fix. It keeps us in the here and now, not the better world we have in mind. Here’s a scenario. Imagine I live east of the Rocky Mountains in Alberta, Canada. Imagine I dream of surfing the ocean waves, an activity I can not do on the prairies. I dream of getting to the West Coast and the Pacific Ocean on the other side of the mountains. In fix mode, I will try to find ways to spend time in the water here. I might try other sports, I might make do with windy lakes in the summer. I might make periodic trips to the West Coast to surf from time to time. However, if I really want to fulfill my passion of surfing I need to shift from fix mode to something else. I need to find a way to make it happen. I am not going to get to surfing life on the West Coast if I am making do with what I have. When I am making do, I put all my energy into making do, not making it to where I want to go. Equally, I will not get what I want if I put my energy into complaining about my current situation either. I will not get to where I want to go pondering why it is that I am not there. To get what I want, I have to shift my attention to what I want, in this case life on the West Coast. Notice where the energy of the city (or any organization for that matter) is focused. Is it on short-term decisions to make short-term course corrections, or is there a focus on where the city is going, looking out further ahead. When riding a bicycle, or driving a car, if focused on the immediate future the ride is jerky. When we look farther ahead, the ride is wiser, smoother. The likelihood of wrong turns is lessened. The likelihood of hitting a pot-hole is lessened. The likelihood of hitting pedestrians or other vehicles is lessened. We move through the world in a safer, wiser way. Our choices as individuals and collectives shape the city. In the back of my mind, I always ask, what am I allowing? Am I making room for new possibilities to emerge? Am I making way for what I want, what we want, rather than putting my attention and efforts in conscious or unconscious efforts to have more of the same. Here is the trick with fixing what’s wrong. First, it puts our attention on what is wrong, rather than what we want. It tricks us into thinking that if we just sort ‘this’ out, things will be right. Sounds a bit like a silver bullet, but it leads us to getting more of the same. When we put our attention to where we are, we stay there. When we put our attention to where we want to go, we move in a new direction. This post forms part of Chapter 4 – An Uneasy Journey, of Nest City: The Human Drive to Thrive in Cities. Nest City is organized into three parts, each with a collection of chapters. Click here for an overview of the three parts of Nest City. Click here for an overview of Part 2 – Organizing for Emergence, chapters 4-7. As I reflect on last Monday’s post, A retreat from the retreat, I realize that my experience is a fractal of the city experience. It is a smaller version of the same thing. I had a sense of where I wanted to go, I had some learning to do along the way, and I ended up somewhere that I could not have predicted. It emerged. Whether I organize as an individual, or as part of an organization or at the scale of a city, nation or planet, we are doing the same thing. These three aspects of organizing our self and selves are each critical. Without a destination in mind, pulling us along, we don’t go anywhere. The power of knowing that we want to be somewhere other than ‘here’ is essential. Movement toward that destination is a learning journey that includes both the process by which I see the destination as well as the journey I undertake to get to the destination. With all of this, we live with great uncertainty in the world. We never know what will come, who we will be in response to what comes and who we will become. As a result, we may never get to an exact destination. Or, we may not get there the way we had planned. Uncertainty requires that we learn along the way. It also means that we don’t know the destination precisely either; it reveals itself over time. Destination emerges as a result of our learning journey. While it might not be the exact destination aimed for, in hindsight we recognize that we travelled in the right direction. The trip was about moving in a direction, not getting to a specific predetermined destination. This does not undermine the value of having a destination in mind, however. It is the critical element that pulls us into the future we desire. We have a choice before us about how to live with these three aspects of organizing ourselves. Most significantly, we have a choice to make about how we nurture each of these elements as individuals and collectives. We can create habitats for them to work well with each other. We can create habitats for them to work well with us, organizing ourselves for unknown possibilities of our choosing. I can create a nest for me. We can create a nest for us.